Download comes with two posters! 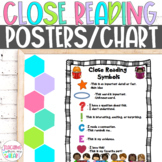 Steps for Close Reading Read with a Pencil (how to annotate text in grades 4-6) These cute posters can be used as anchor charts for your classroom. They can be used a a reference to remind students how to annotate a text during close reading. 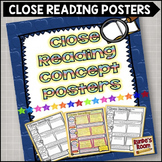 These CLOSE READING Posters & Lesson Resources can be used again again all year long! :) These posters and resources work for NONFICTION CLOSE READINGS, FICTION CLOSE READINGS and POETRY! 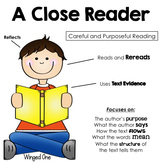 :) In this resource pack: - "What is CLOSE READING?" 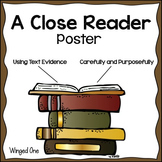 mini poster and large posters - "Why do I CLOSE READ? 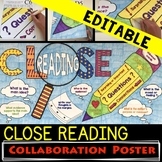 Close Reading Posters & Checklist! Questions to inspire students while reading! 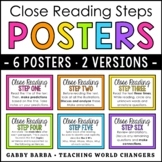 This poster helps students remember the steps in close reading. I transformed the word close into an acronym that will help students remember how to close read! The Common Core has come and close reading is a strategy that you hear over and over. 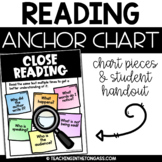 In this file you will find posters to help navigate your students toward reading closely and carefully. These posters can work with both nonfiction and fictional texts. Enjoy!